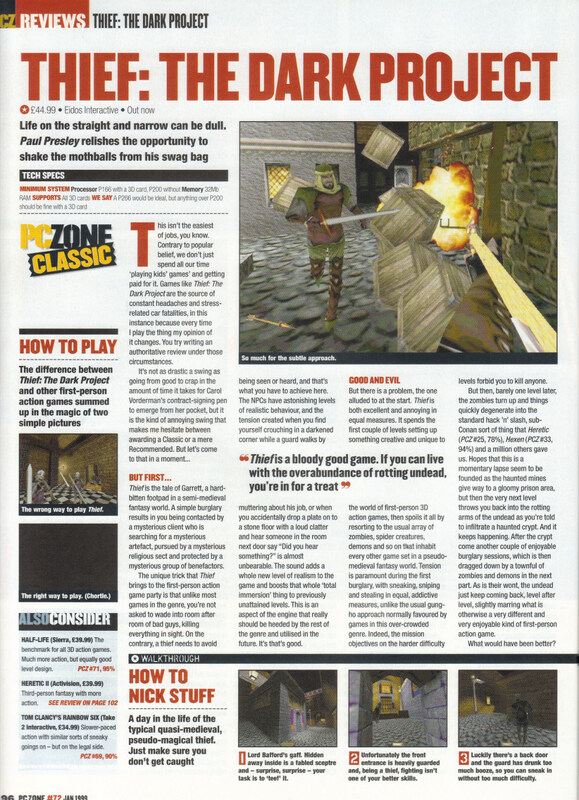 This is from the December 1998 PC Zone. The penultimate mission starts with me discovering dead bodies on the way to the temple. Something is amiss…. I had been wondering how I was going to sneak in through the front door but when I get there the place is a mess with more bodies and statues toppled. Constantine has been here first and the beasts from the last level are patrolling the corridors. There is a lot more shade here so I’m better able to sneak up and blackjack them than in the previous level. Apart from the destruction the temple is the same as before. For the most part its empty. There are a few bonus items to pick up for exploring but the main area of interest is the altar which has been moved to reveal a ladder to underground caverns. I’m not clear on what this area is supposed to be but there is a large series of rooms including some very strange areas like this one floating in a void. 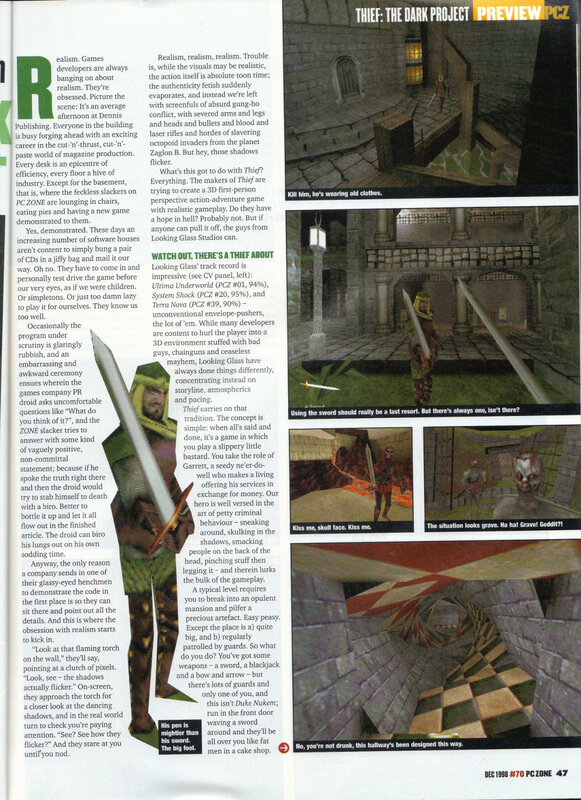 The level is well guarded by the same creatures as before + a new variety of spider which is particularly nasty. On the whole I’m finding progress here a lot easier though. I find a window with the Hammerites behind it. They are under siege by Constantine’s troops. Their high priest has been kidnapped and they want me to rescue him. They also ask me to return their sacred chisel which I’ve already found this amongst some spiders higher up. TO help me out he gives me a map and a key. The key opens up the only locked door I’ve found upstairs. I soon come across the area with the high priest. This has 3 guards around a campfire and isn’t the easiest place to sneak into. 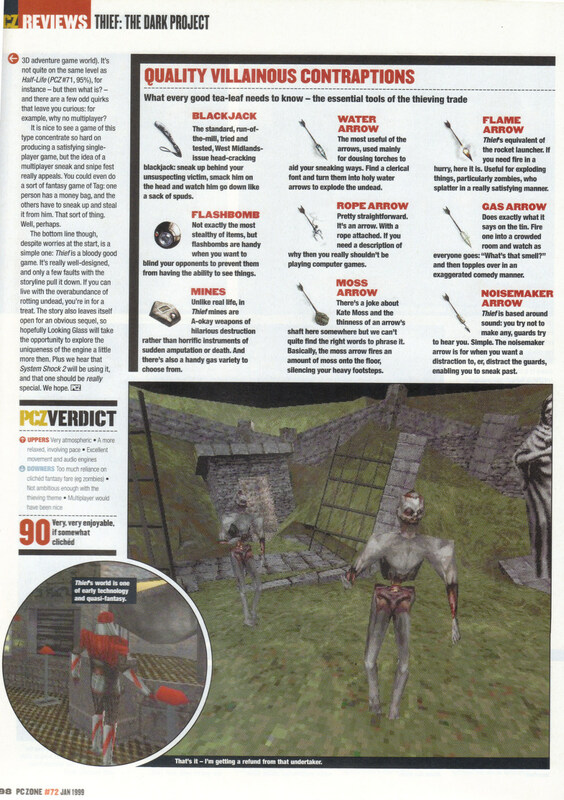 I use a water arrow to put out the fire + a couple of gas arrows and then blackjack the last guard. The priest is lying in the corner. I have to carry him all the way back to the siege window which takes a while but is easy as I’ve already cleared out the route. I get him here but I’ve still not completed the level as I have one final requirement to destroy all insect-beasts. I’m assuming these are the giant grasshoppers and I’ve blackjacked every one I’ve seen but I head out searching for more. After a while searching it occurs to me that the objective is to destroy the beasts. I have to search out all the bodies and use my sword on them until they stop bleeding. This is a bit of a pain but the level isn’t that big so I soon finish this and it completes that objective. I now just have to walk all the way back to the siege window with my chisel. This level has been decent without being anything too special. It’s moderately easy with a lot of the map being used up on the same temple locations I’ve seen before. It would have been more fun if I hadn’t had to seek out the insect-beast bodies but I possibly should have thought of killing them sooner. That brings me to the games final level. The Hammerites have given me a fake eye which I can swap with the real one to stop Constantine. First I have to get to him which means descending into the Maw Of Chaos. This place starts off like a typical end level for a game of this time with a load of coloured lighting. It settles down into a more traditional cave level shortly afterwards. I’m constantly having to go down to reach Constantine. There are plenty of guards in evidence but I don’t feel the need to take them all out this time. They all tend to be on their way up so I just wait for them to pass and head on my way. As I get further down, the terrain starts to change and I enter a volcanic area. This then gives way to giant crystals (presumably of ice). These hurt if I walk into them and the ground is also slippery which makes this happen quite easily when you are trying to pick up the water crystals placed by each one. I carry on down through increasingly rough terrain, including a pit of platform hopping above lava until I get to a very strange looking hole in the ground. The laws of physics have taken a holiday here and I have to swim through a series of tunnels (and up a waterfall) until I’m swimming in the roof above this hole. I then dive out and into the water at the bottom. The sights of this level continue to get stranger and I find the trunk of a monumentally big tree. I have to go inside here and climb up to the top. I then cross a particle bridge…. …into a room that looks very much like I’m nearing Constantine. The room is trapped and the lights in the wall shoot at me. I notice a pattern of shadows on the floor which may have helped but I just bunny-hop through at speed and get by unscathed. Through here is a portal. This is where Constantine’s forces are coming from and one of my mission requirements is to get it closed. I can’t actually get to it from here which means I need to use arrows. There are four fires burning on each corner of the portal and I simply have to shoot each one with the appropriate type of arrow. This isn’t all that easy a shot at this distance, especially as the various arrows fly differently. I only have one left of a couple of arrow types and have to reload a few times before I manage it. In the next room, Constantine is preparing his incantation. He has his back to me and I have to quickly take the chance to swap the eye. Doing this quickly enough isn’t all that easy as he tends to turn around before I manage to back away again into the shadows. In the end I do this by shooting a few moss arrows into my path and running in and out over the now silenced ground. From here on its just a simple case of waiting for Constantine to finish the ritual. This end mission was well done, concentrating on the sneaking and also not allowing me to ever get lost so the game accelerated toward it’s conclusion. It’s a fitting last mission for the game. The fake eye does its thing and Constantine is killed without completing his plan to destroy the world. The end cutscene shows me (complete with new eye) talking to one of the keepers. This keeper thinks I should seek out a book of runes but I’m not interested in helping them out and tell them I’m through. He seems to think I’ll do it anyway as prophesied and tells me to beware the age of metal. 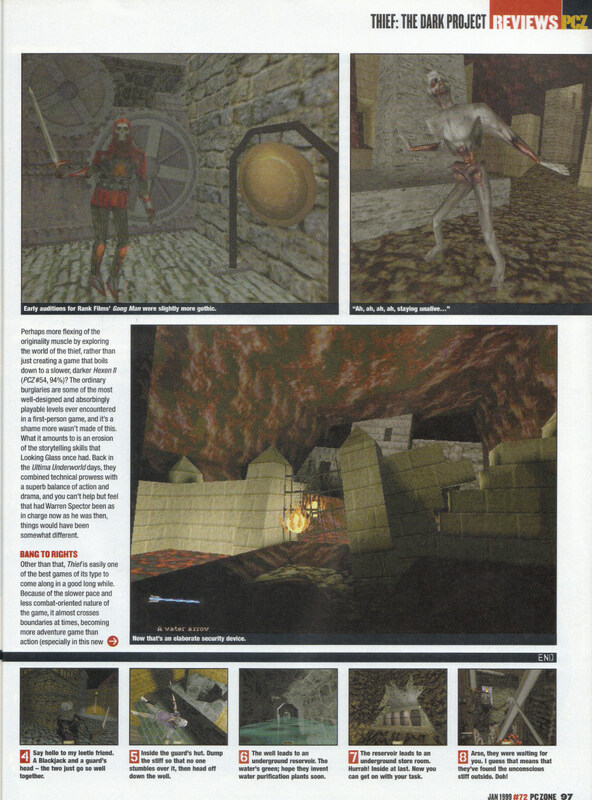 I’ve enjoyed Thief a lot but I’d need to have played this at the time to consider it a true classic. It’s a game that might get better with replaying though, as I’m far from clear about the storyline. I’m not even certain exactly what Constantine was trying to achieve although I’m sure it was mentioned in a book somewhere along the way. 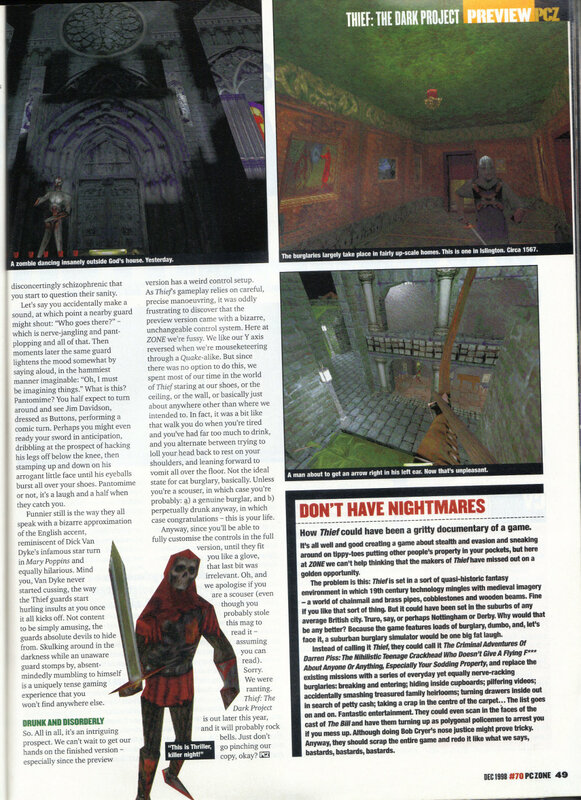 The best levels were added in Thief Gold and were not there in the original product. 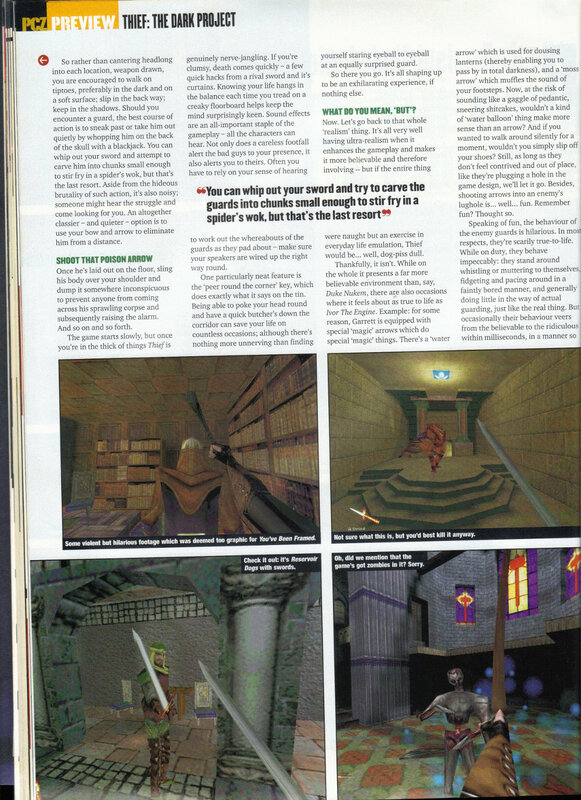 Take these levels out and Thief would be an interesting game but something of a lost opportunity with a lot of poor levels near the start. 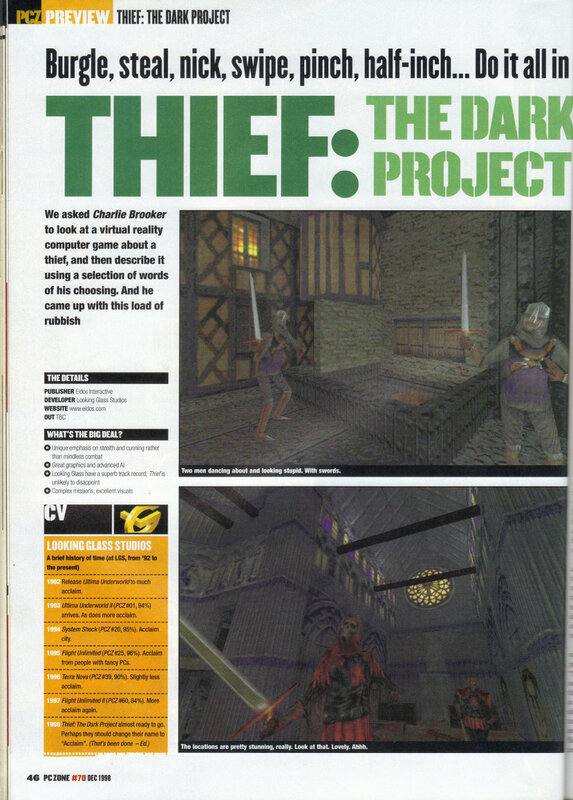 If Thief 2 has a full set of missions equivalent to the extra ones added to Thief then it should be the classic that Thief nearly was. This is still a great game that I should have played years ago though. I’ve always found FPS games age especially badly but the gameplay still strikes me as original even now and I’m very much looking forward to the sequel. I’ll have to find somewhere to buy it first but I’m assuming that won’t be too difficult. I’ve just bought a ludicrous number of games from GOG in their Interplay 2 for 1 sale + I’ve got the 2nd Tales of Monkey Island game to play so it could be a while before I get to the next game on here. I’ve been fancying a look at some of the various bits of Origin literature so I’ll probably start on some of that next, with either Forge of Virtue or Avatar Adventures.